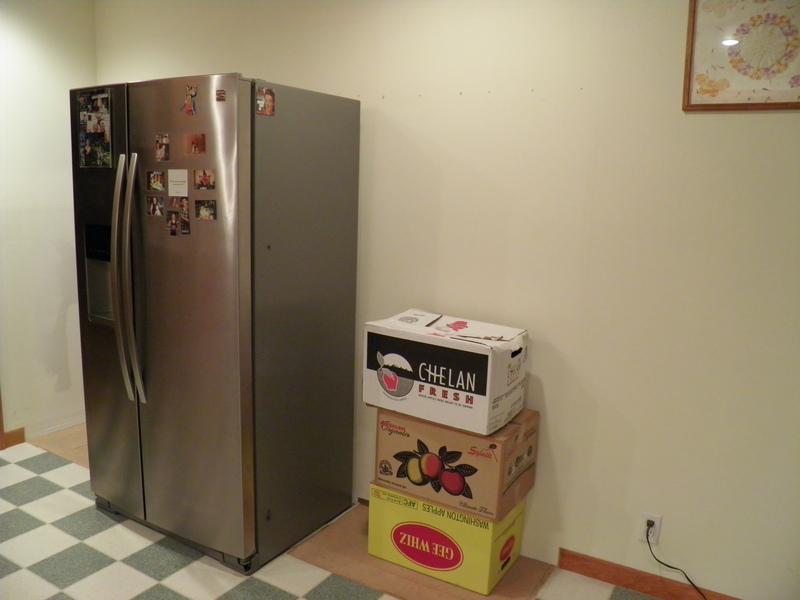 I’ve categorized this post under “Remodeling the Kitchen” because while I’ve been working on packing up the kitchen in preparation for tearing it all out, I’ve been trying to finish another project I started before Thanksgiving. 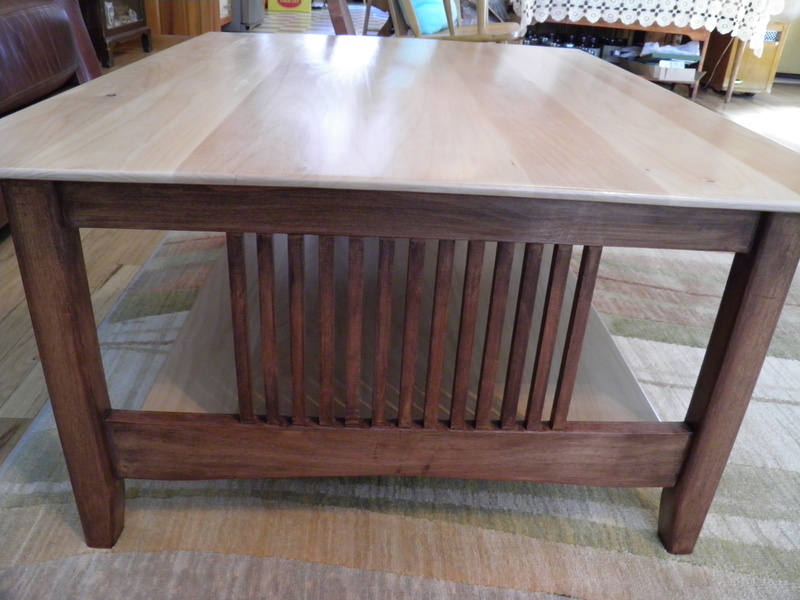 I’ve been trying to get this Mission-style coffee table refinished. I call this the well-traveled table because it has really gotten around in the last ten or so years. From 2003 to 2010, I lived and taught in Las Vegas, Nevada. I furnished two rental apartments from second-hand stores, and then I bought a fixer-upper in Las Vegas. I had been living in really small apartments, and the house wasn’t very big, but I didn’t have enough furniture for it. Dennis decided to buy some furniture for the Vegas house at the Victims of Crimes Benefit sale. The inmates enrolled in the woodworking program in one of the local prisons make a number of items for an annual sale to benefit the victims of crime. 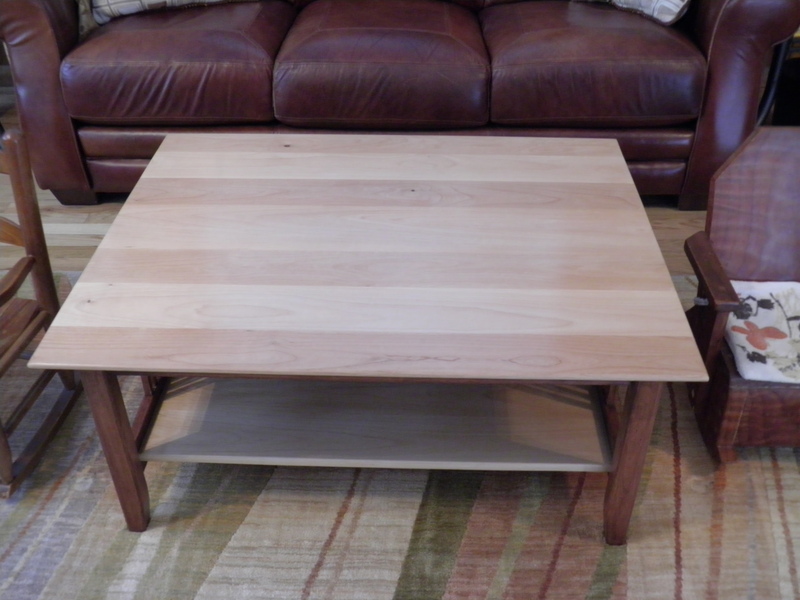 Dennis bought a beautiful corner table made from birds-eye maple, two oak plant stands, and the Mission-style coffee table, and gave them to me for Christmas. I loved all the pieces. I left the corner table at home in California because it fit perfectly there and gave me a place to display some hand-thrown pottery, but the rest of the furniture came down to the Vegas house with me. The coffee table lived in the Vegas house for three years. Then it moved to Denver with my daughter, Amy, and her husband, Solomon. Amy and Solo had lived with me in the Vegas house while Amy attended dental school at UNLV. When she finished her program, they moved to Denver so that she could take specialized training. When Dr. Amy graduated from her periodontal program in Denver, the coffee table was loaded into another moving truck, and back it came to Reno, Nevada, where Amy and Solo bought a periodontal practice. The table lived in their rental house for about a year before they decided it no longer worked with their new furniture. At that point, Amy asked me if I wanted the table back, or if she should try to sell it or donate it. I think she probably already knew what my answer would be. Everybody in the family knows I am sentimental about things. Dennis bought that table for me at a very stressful time in our lives, when we were conducting a long distance marriage. It was a sweet gesture, and the table will always be special to me for that reason. In addition, I’ve always liked the Mission furniture style, and we have other Mission-style pieces in the house. I decided I’d rather have the well-traveled table than the one we currently had in the living room. There was just one problem. I’d never liked the ugly, yellowish-brown finish on the coffee table, and by this time, it was pretty beat up from all its travels. 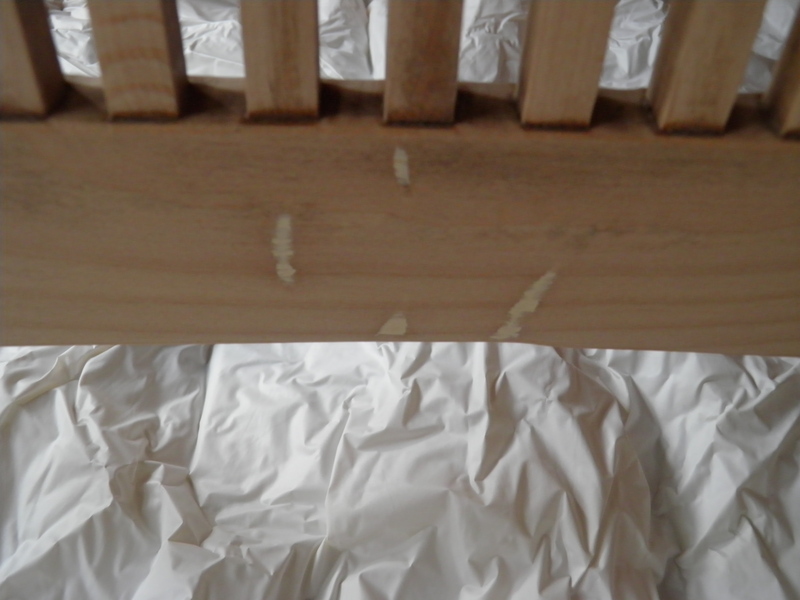 In the move from Denver to Reno, one of the side support pieces had suffered some bad gouges that needed to be filled. And after Amy and Solo rescued a sweet, badly injured little Yorkie, the bottom shelf got pretty scratched up from doggie toenails. So the table needed a facelift. I’ve refinished a lot of wood furniture and all the doors in the house, including the closet doors. I used to really enjoy it, but I have to admit, this project was not as enjoyable as my other adventures in wood refinishing have been. Stripping and sanding are really hard on my back and hands now, and I needed a lot of help from Dennis on the sanding. He really did more of that than I did, and it was hard for me to trust him to do it to my standards! In fact, I sent him back to the sander more than once, and I probably should have been even stricter about it than I was. But eventually, the well-traveled table was stripped, sanded as good as it was going to get, and ready for stain and finish. I decided to do a two-toned effect, partly because the lower parts of the table were very difficult to sand, and I knew it would be impossible to get the old, ugly stain out completely, and partly because of the filler in those deep gouges, Filler never takes stain quite like the wood surrounding it, in my experience. But I wanted the top and the bottom shelf to be natural. I knew the wood had beautiful grain and character. So I decided to stain the legs and side pieces a dark, reddish brown that would look nice with my brown leather couch. And I kept the top and shelf light with the application of a clear, water-based polyurethane that won’t amber as it ages. I really like the contrast of the light horizontal surfaces with the dark legs and support pieces. Now this piece that Dennis bought for me years ago has its second wind and a new life in the living room here in the house in the woods that I fell in love with in 1987. I like the way the table looks with the other woods in the room, the knotty cedar tongue-in-groove planks on the walls, the old, unstained oak plank floor, and the birch doors. It took quite a bit longer to finish the table than I’d figured it would, and after the deadline for Thanksgiving passed, and then the deadline for Christmas passed, I knew the table had to be finished before we started ripping out the kitchen. In part that was a practical decision, because the slate coffee table had to come out and the Mission coffee table put in place to make room for the temporary storage in the living room of the kitchen appliances. Now that the well-traveled table is done and in place, it’s onward to demolition of the kitchen. The pantry cabinets (the really big ones) came out yesterday, and I ordered flooring today. Progress!